Home + News + Where Should Chemicals and Flammable Liquids Be Stored? Where Should Chemicals and Flammable Liquids Be Stored? Many of these liquids are combustible or flammable, and present a fire hazard if not properly stored. Where Should Chemicals Never Be Stored? 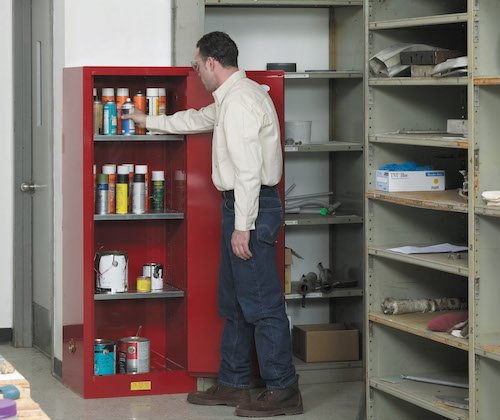 Flammables on open shelves - While convenient for easily accessing items used daily, avoid storing flammable maintenance and cleaning chemicals on open racks and shelves. Corners - Out of sight, out of mind? 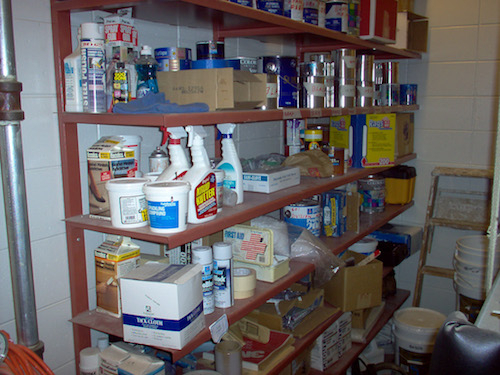 It's easy to shove stuff in the corner, but it's not the place to accumulate half-empty containers of chemicals. Old, dilapidated cabinets that no longer close properly or have holes or hasps drilled into them - Not only are these NOT compliant, they're also dangerous. Missing or broken door handles compromise the security of dangerous flammable liquids by facilitating unauthorized access. And any modifications made to a safety cabinet void its certifications. Overflowing cabinets and/or liquids stacked on or around the cabinet - If your cabinet doors are always open because there is too much inside to properly close, it's NOT doing its job effectively and has become a safety hazard. Additional safety cabinets may be in order. Look for cabinets that carry independent, third-party certification from FM Approvals or MPA Dresden. With more than 300 models ranging in capacities from 4- to 115-gallons (15- to 435-liters), there is likely a Justrite safety cabinet that meets your specific indoor chemical storage needs. Justrite Sure-Grip® EX Classic Safety Cabinets offer top performance for flammable liquid storage and protection. Click here to learn more about its many features and what makes it so safe. Don't see what you're looking for? Or do you need a cabinet to meet a specific need? Our Custom Cabinet Program offers you the ability to design to your own specifications. Justrite flammable safety cabinets help companies comply with regulations and reduce fire risks to keep employees safe. All Justrite cabinets are made in the USA of US and imported parts and carry a 10-year limited warranty. See all our chemical storage options.